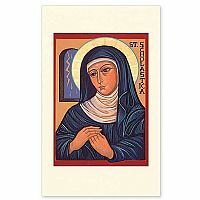 Saint Hildegard, though born weak and sickly in 1098, became one of the most well-known women of the middle ages. A writer, poet, composer and founder of a Benedictine community, her creation-centered spirituality is more in tune with the 21st century than with the 12th. In the year 1106, a weak and sickly eight year-old girl was dedicated to the service of God by her parents. She entered a monastery at Disibodenberg in Germany. Little Hildegard rose from this humble beginning to become one of the most well-known religious women of the middle ages. Her health was always poor. Modern opinion surmises that she suffered from debilitating migraine headaches, so severe as to cause visual hallucinations that she and others interpreted as visions from God. Despite her handicap, she lived for an incredibly productive 81 years. She wrote many books, visionary and revolutionary for their time and remaining so today. These include works on her visions, spirituality, and natural medicine. She composed music for her community�s liturgical worship. To the untrained ear, her music sounds like Gregorian chant, but is in fact quite unique. 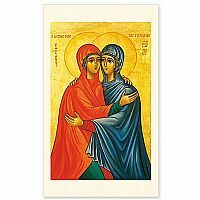 She also composed a liturgical drama, the earliest known passion play, which has been revived and is performed in our time. Her writings that have survived to the present include nine books, seventy poems, seventy-two songs, and over one hundred letters to emperors, popes, and other clergy and nobility. Although she came from a time that was dominated by Augustinian fall/redemption theology, she was very much an advocate for a creation-centered spirituality that is more nearly in tune with the twenty-first century than the twelfth. Through her work and her memory, she remains a champion of the strong contributions that women can make to the creativity and wisdom of our religious culture. 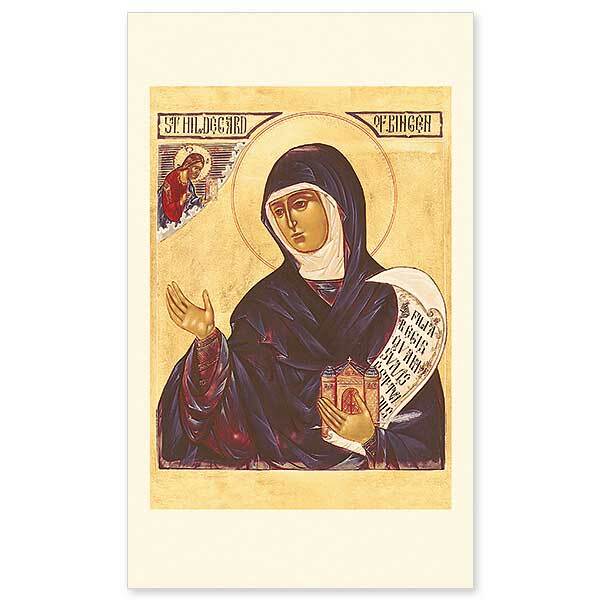 Hildegard�s icon shows her dressed in Benedictine black, head surrounded by a halo, the iconographic symbol of sanctity. 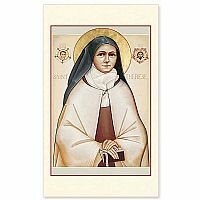 She has never formally been canonized, although she is listed in the Roman Martyrology. 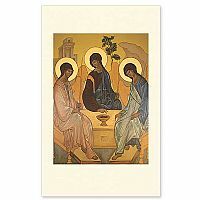 The background of the icon is gold, used in icons to represent divine light because of its ability to reflect and enhance light in a manner so different from pigment. Her face is not intended to be a realistic portrait, and in fact, history has provided us with no record of Hildegard�s physical appearance. Instead, we see a symbolic, spiritual face; the eyes large and gazing at infinity, the nose long in the Byzantine ideal of nobility, the mouth small and closed in the silence of contemplation. Flesh tones are dark in most icons. A pigment called �sankir� is used as a base and it contains yellow ochre, black, and green. She carries a church or monastery, symbolic of the communities she founded. After her election as superior of the convent at Disibodenberg, she moved it to Rupertsberg near Bingen in about 1150. In 1165, she founded another convent at Eibingen on the other side of the Rhine. Hildegard also carries a quill pen and a page from her writings in Latin, reminders of her prodigious creative output. As a symbol of her many visions, Christ appears out of the clouds in the upper left, revealing to her His divine word. 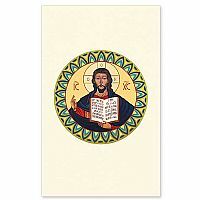 Near the image of Christ may be seen the letters �ICXC,� an abbreviation for Jesus Christ in Greek.